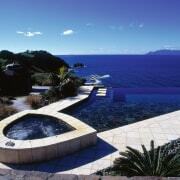 View of a spa and swimming pool on a cliff top looking out to sea, stone pavers and surround of the spa, many plants and trees, pot plants wooden decking and a gazebo beyondpebbled gardens. Swimming pools have come of age in the past decade. No longer an afterthought, they are most often an integral part of the overall architectural plan for a new home. And even when they are added at a later date, they are likely to form a key part of a landscaped outdoor living area. For this reason, many people opt for a concrete pool that can be custom built to any shape and size, and integrated into the wider landscape. Concrete pools are also an investment. They add value to your property, but they need to be well constructed with great attention to detail. Professional concrete pool builders with decades of experience know all the potential pitfalls and can ensure your vision is realised. These pages feature concrete pools built by Frontier Pools, Morgan Pools and Tranquility Pools three companies with extensive experience constructing pools in the greater Auckland area. The principals of these companies, Neil Runciman, Carlos Morgan and Laurie Tanner, answer frequently asked questions. Is there a reason why I can't just choose the cheapest quote? This is a potential trap for homeowners, says Neil Runciman of Frontier Pools. "Constructing a concrete pool is complex, with many consents required and compliances that need to be adhered to. The work needs to be carefully managed it is not a quick job. Pools are not built in isolation, which is what many cheap operators like to do. 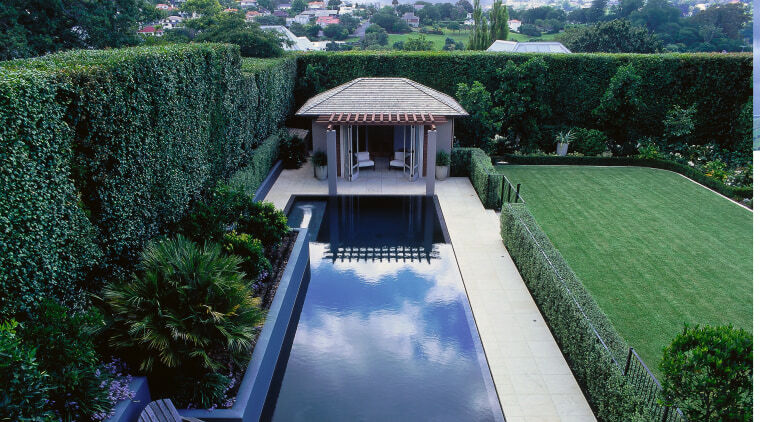 Morgan Pools created the pool, spa and water features for this house. 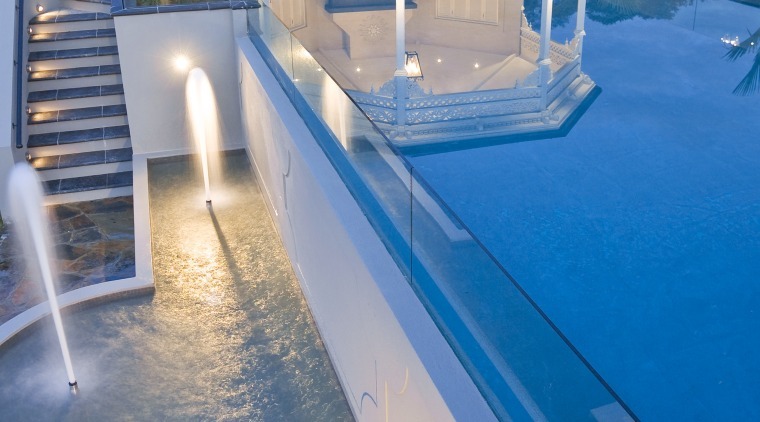 Glass balustrading on one side of the pool provides an interesting visual feature from the fountain area on the lower level. "You also need to know exactly what you are getting for your money in terms of quality. Are you getting state-of-the-art pool equipment that will go the distance, or a cheap option that could well give you problems and end up costing more?" "Many homeowners don't realise they are not comparing apples with apples," says Carlos Morgan of Morgan Pools. "They are simply not aware of the technicalities involved with both the construction and the pool equipment be it the lighting or filtration system. Your first expense should be your last expense. 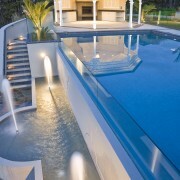 With a professional pool builder there are no hidden costs. Everything is presented up front and we have service warranties." Laurie Tanner of Tranquility Pools also says homeowners can be in for big expenses if a pool is not built well and costs are cut with the pool equipment. "We have all been called in to fix pools that have been built on the cheap," he says. "Often, a homeowner ends up spending more than they would have spent choosing the professional builder at the start. Professional pool builders are also involved right from the start, liaising with architects and designers in the planning stages and advising on the best solutions." Runciman says many concrete pool builders can only make money through volume, so are less likely to liaise with clients and designers. "They don't have the time or the resources to attend to details that we see as essential." The pool adjoins a large flat lawn. How do I know a professional pool builder is someone I can trust? "Look at the experience," says Morgan. "We all have a history, with decades of experience, and reputations to uphold. Our staff are well educated and fully trained, and all our companies have premises there's a very solid base to our business." 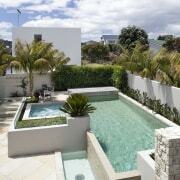 What are some of the challenges faced by concrete pool builders today? 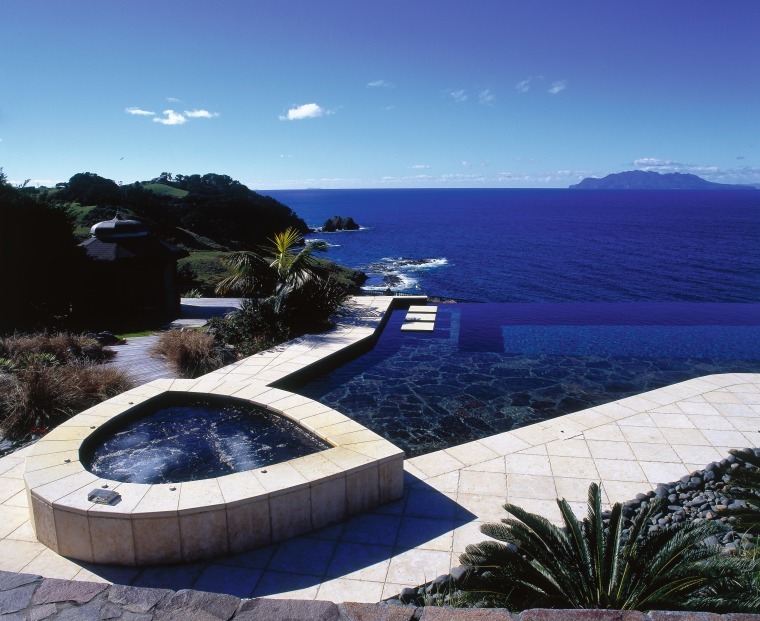 Modern pools are frequently built on tricky sites, including cliff-tops, says Runciman. 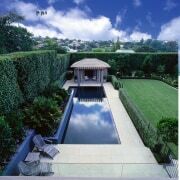 "Challenging projects include sites where pools have to be cantilevered, and sites with narrow access. Professional pool builders have the know-how and resources to handle such challenges." "People are wanting more complex water features," says Tanner. "We are building a lot more difficult pools with weirs and infinity edges. We are also doing more stainless steel work to customise finishing details." Morgan says many modern pools are feats of engineering, requiring deep piles and steel beams. "With professional help you can even build on the edge of a cliff, and the results can be amazing."